Non-working lamps will be replaced, and others will be converted in batches over the next four years. If the way Forest Grove's streets are lit at night starts looking different to you, it might not be your imagination. The city is planning to change its streetlight bulbs to light-emitting diode (LED) models in the coming months and years. About 2,000 streetlights are slated for conversion, according to Keith Hormann, director of Forest Grove Light & Power, the city-owned electric utility. They include multiple models and wattages, with several different streetlight designs coexisting in Forest Grove. The streetlights won't all change over at once. Briefing the Forest Grove City Council on the plan Monday night, Sept. 24, Hormann said the replacements will be done in phases over the next four years. "We decided the best way to do it was just geographically," Hormann told the council. The first phase is expected to cover the east end of town toward Cornelius, east of Hawthorne Street, as well as the Highway 8 couplet through downtown Forest Grove, which Hormann said will enjoy increased wattage in its streetlights as well. The four-year project is estimated to cost about $600,000, or roughly $300 per light. That pencils out to $150,000 per year with the phased approach. Hormann said streetlights that fail outside of the phased areas will also be replaced with LEDs instead of with the older types of lamps. "So we don't want to make another trip down the road, we're just tracking that through our mapping that it's already been (converted)," Hormann said in response to a question from City Councilor Tim Rippe. Forest Grove Light & Power first experimented with using LED bulbs in city streetlights in 2014. That year, crews installed 25 LED streetlight bulbs as part of a pilot program. 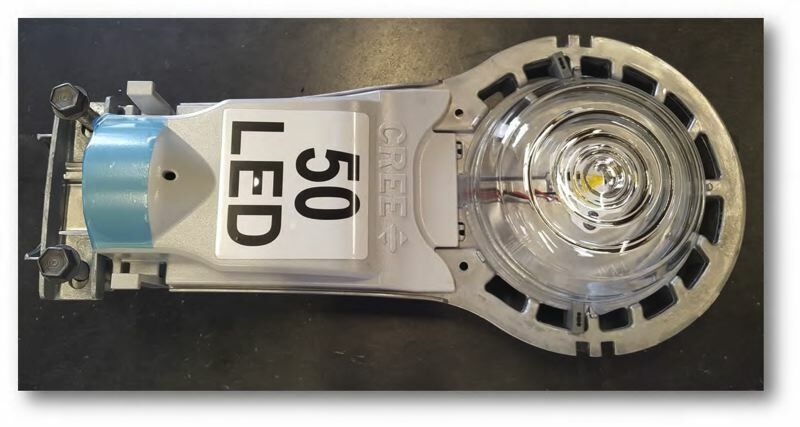 Forest Grove Mayor Pete Truax remarked that the LED alternative is "cheaper and less polluting" than the older-style lamps, and Hormann agreed. The most common streetlight bulbs in Forest Grove currently are high-pressure sodium lamps. LEDs are more energy-efficient, and the idea behind replacing the streetlights is that the power savings will ultimately pay for the cost of the conversion. "The energy savings will be … at least 50 percent of what it's costing now," Hormann said, responding to a question from Councilor Elena Uhing. "Right now, the energy cost is around $98,000. So we'll be saving $50,000 there at least, and then there will be very little in maintenance that'll have to be paid to our department, because — I won't say they're maintenance-free, but — they'll be much better than the current high-pressure sodiums. So around $100,000 per year."